Home » Why Costco Is Great for College Students: Services and More! I love Costco! In fact, I have highlighted before how you can use Costco to save. Well, after a recent trip to Costco, I discovered how it is great for college students to save as well! The tough part about shopping at Costco is that it requires a membership to join. 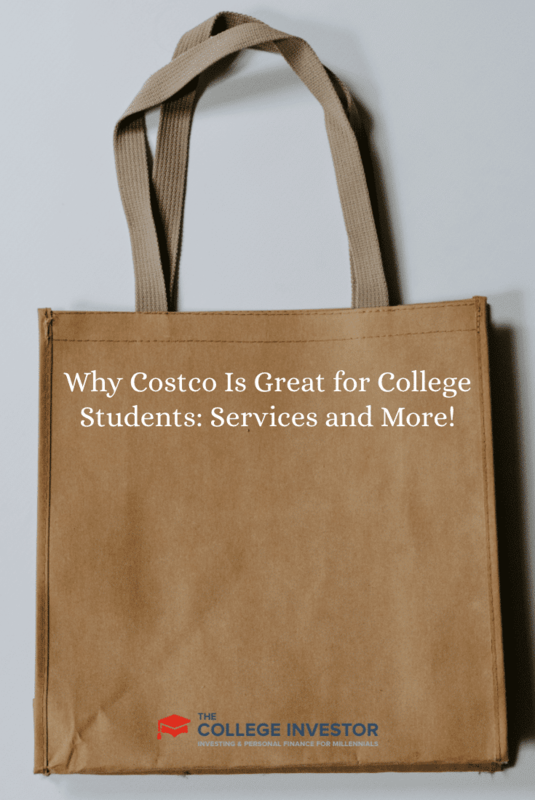 A lot of students have been hoping for a Costco college student membership (think Amazon Student), but Costco doesn’t offer one. For most college students, the Gold Star Membership is probably perfect. Remember, to make the Executive Membership worthwhile, you need to either spend $6,000 per year to get your 2% cash back, or take advantage of the services below. Some of the services provide extra rewards for Executive Membership, which could easily pay for the difference. Costco.com is a great place for college students to save. They have a huge technology section that includes laptops and software, and most of their prices are cheaper than other stores, and very competitive with campus bookstores. The great thing about Costco.com is that they never charge shipping and handling, and that every product is returnable to a store no matter if the store carries the item or not. Auto Program: If you are looking for a new or certified pre-owned car, Costco can arrange for special member pricing at local dealerships. The savings can be huge, and I have heard that car dealers will even go lower than the Costco price sometimes. Online investing: Costco has also partnered with ShareBuilder to offer members up to a $50 bonus and $2 trades. For college students, if you sign up for an automated plan, this is probably the best investing plan available. Plus, you get that $50 bonus if you hold an Executive Membership. Insurance: If you live in California, you can buy supplemental insurance through Costco and it is relatively cheap. This can be especially helpful for college students who may not get coverage through their parents or university. Another great thing that Costco offers for everyone, but could be helpful to college students saving, is the Costco cash cards. These cards are essentially gift cards, and members can load them up with the amount they would like to give. The great thing about these cards is that the person using them does not need a membership of their own. The card counts as a membership when used. So, parents can load the card up at home and send it to their child in college, who can use it without having their own Costco membership card. I hope this helps you save some money on stuff you would buy anyway! Readers, what do you love about Costco? Costco does have an awesome return policy! Just make sure you don’t overspend! I don’t like Costco because shopping there for a family of two doesn’t make sense. But I totally agree that it can be really good for students. Still might be expensive to put down all at once about $50 for a purchase. My wife and I love shopping there for the two of us. We just are mindful of what we buy in bulk. We never buy fresh stuff in large quantities, but paper goods totally makes sense. Oh man, I remember making trips to Costco back before college, but my university doesn’t have one nearby. I didn’t know they had free shipping and handling, thats awesome. I’m also in the market for a new laptop, so this is good news. If the offer is good I won’t have to hop in the car and make the drive to a local store if I can get free shipping. The free shipping from Costco.com makes it very competitive. Plus, if you don’t like it, you can return it! I can totally see how Costco would be excellent for a college student. The gift card idea is good, especially since apparently you don’t have to be a member….didn’t realize that. Costco isn’t for everyone, but I like it. You just might have to plan to buy something unexpected though….just make it usable and worthwhile! I love the free samples! And you can’t beat the hot dog combo for $1.50! I loved Costco and I have been a member since 1995 back when it was still Price Club in my area. The huge discounts, wholesale prices, and the rebates more than pay for the membership itself. I remember Price Club, and then it became Price Costco for like 2 years before switching to just Costco. I didn’t know you didn’t have to be a member to use the Costco Cash Cards. That amazes me. I might go try that out sometime. My only issue is that buying groceries in bulk might make a college student burned out of eating a food they buy in bulk and tempted to go eat out somewhere.